How Did the Toronto Raptors’ Summer League Go? Not So Well. This past Friday, the Toronto Raptors began their annual Summer League trip down in Vegas, and well... it didn’t go so great. 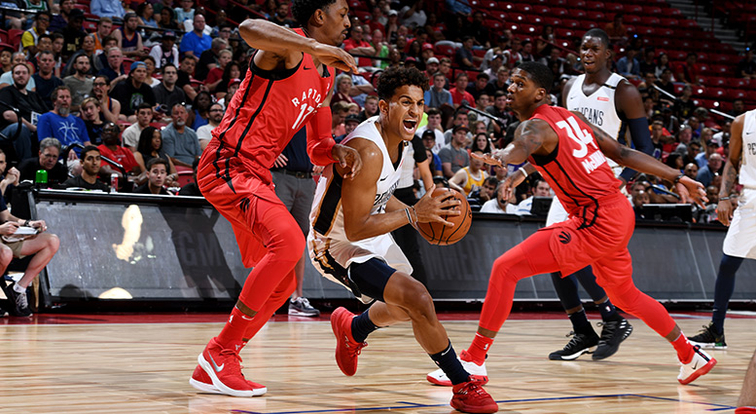 The team kicked off their Summer League campaign against the New Orleans Pelicans. Included on the roster were the likes of regular Raptor OG Anunoby being on the squad, alongside Alfonso McKinnie, Malcom Miller and Malachi Richardson. The first quarter started out close, with the Raptors staying within just five points. New Orleans ran away with the game in the second quarter and carried a lead into halftime to ultimately win the game. Although the Raptors dropped its first game, it wasn’t all bad news. While that was happening in Toronto, over in Las Vegas the current Toronto Raptors were getting in on the action sitting court-side getting a look at the young guns representing the team. The likes of All-Star DeMar DeRozan was one of the players there, along with CJ Miles, Delon Wright, and Pascal Siakam. The veteran Raptors got a good look at OG Anunoby who is entering his second season in the NBA. He didn’t have the best performance, only putting up 9 points and 7 rebounds in 27 minutes of play against the Pelicans. Rawle Atkins out of Arizona got a few heads turned, scoring 12 points and getting praise from the coaching staff and new head coach - Nick Nurse - after the game. Game Two was a better performance from Toronto as they took on the Minnesota Timberwolves. It was a close game throughout, until the fourth quarter. With the Raptors carrying a one-point lead heading into the final frame, their offence and defence got a little sloppy, allowing the T-Wolves to go on and outscore Toronto 32-19 in the final quarter to come away with a 103-92 win. With all eyes on OG Anunoby to have a bounce back game, he did... sort of. Shooting a total 5-for-15, putting up 13 points in 26 minutes, while having the most points in the game out of the Raptors’ starters. The bench put up a huge performance behind the likes of Malachi Richardson, who the Raptors picked up this past season in a trade for formerly loved Raptor Bruno Caboclo. Richardson put up 15 points in just 20 minutes. Jordan Loyd, out of Indianapolis, also helped, putting up 17 points in 23 minutes, leading all Raptors. Fred VanVleet was in attendance for this game, 24 hours after signing his new contract with the team. He received a lot of buzz from reporters being the new hot topic of the team for the day. Onto Monday, where Toronto played their final game of the Summer League preliminary stage against the Thunder with a 0-2 record. After two great performances from Malachi Richardson in the first two games in Vegas, he was inserted into the starting lineup playing small forward, while OG was slid down to power forward. The game didn’t start how Toronto wanted, only taking a lead twice in the first quarter. Those were the only two leads of the game for Toronto. Toronto got outscored 31-21 after the first 12 minutes and the Thunder never looked back; ultimately defeating Toronto 92-82. But there were positives to take from the game. It seemed like the combination of OG Anunoby and Malachi Richardson paid off with OG putting up 19 points and 6 rebound in 27 minutes, while Malachi put up 17 points in 28 minutes. Giddy Potts - a 6’2 guard and 21-year-old from Middle Tennessee - put up 15 points in 15 minutes of work. Nurse ended the media day with the following statement for these young stars to try and earn their spot on the roster, or a potential spot on the talented G-League Raptors team - the 905. Although it seems like the 2018-19 NBA season is soon approaching., it doesn’t mean the news ends here for the Raptors. Nick Nurse is in the process of filling in assistant coach roles and with recent rumors of the Raptors possibly being in on All-Star Kawhi Leonard. But only time will tell. That’s a wrap on the Toronto Raptors 2018 Summer League preliminary games with a champion planned to be crowned on July 17.